A great opportunity to own 2 large parcels of land with ditch irrigation in the far north valley. Property has a home and shop in the front 1. 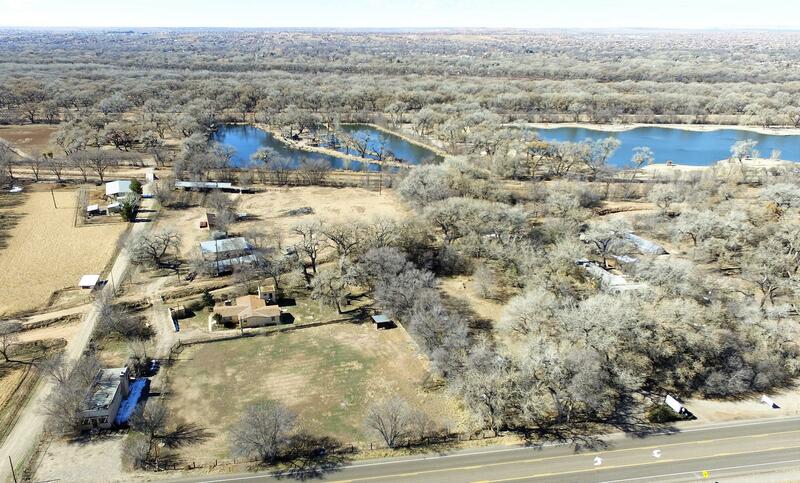 58-acre portion and an additional 2. 76-acres of land in the rear (west). This listing is for the entire 4. 34-acres! The back lot backs up to shady lakes and beyond is the bosque. The property to the north is also the shady lakes. The property is nice and flat for animals and horses. Great views of the sandia mountains! Home & improvements being sold ''as is''. Owner selling both parcels for land value. The home and shop is being sold as a buyer fixer upper. A home loan is most likely not possible due to age and condition. Views, views, views! Wonderful custom 3 bedroom plus office, 2 living area, 3. 25 bath, 4. 5 car garage estate that is gated and is placed on a amazing view lot looking out to breathtaking city and mountain views. 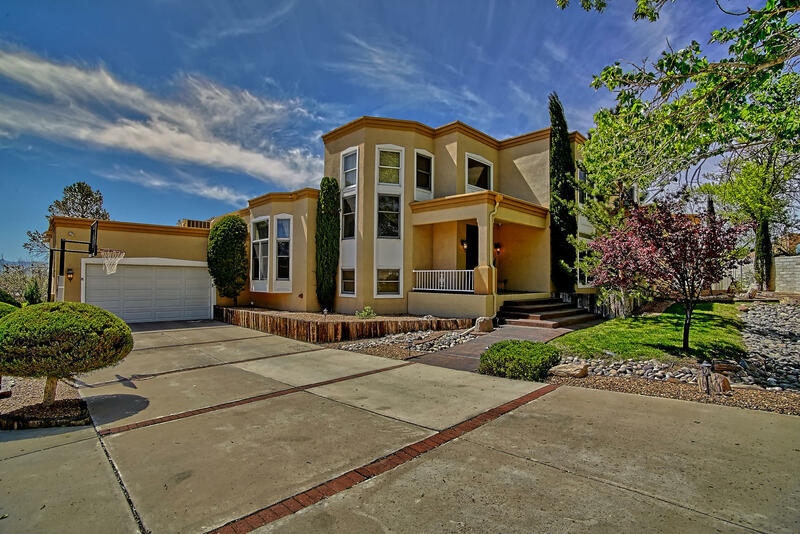 This home has been fitted with lots of upgrades and improvements including totally remodeled kitchen with custom cabinets, granite counter tops,, double ovens, 2 dishwashers, buffet island and so much more. Large master bedroom has gas log fireplace, view balcony while the master bathroom has separate over sized jetted bath tub, large shower, 2 separate vanity's, exercise room and walk in closet. 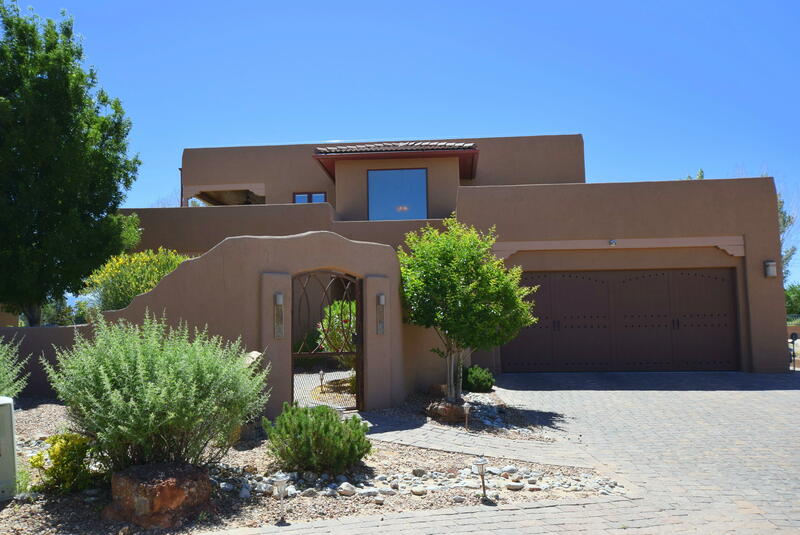 The 2nd living area is the perfect game room with outstanding wet bar with sitting area, custom kiva fireplace, private patio with outdoor kitchen with grill, cook top and refrigerator. Extraordinary opportunity to become a business owner and home owner in one! 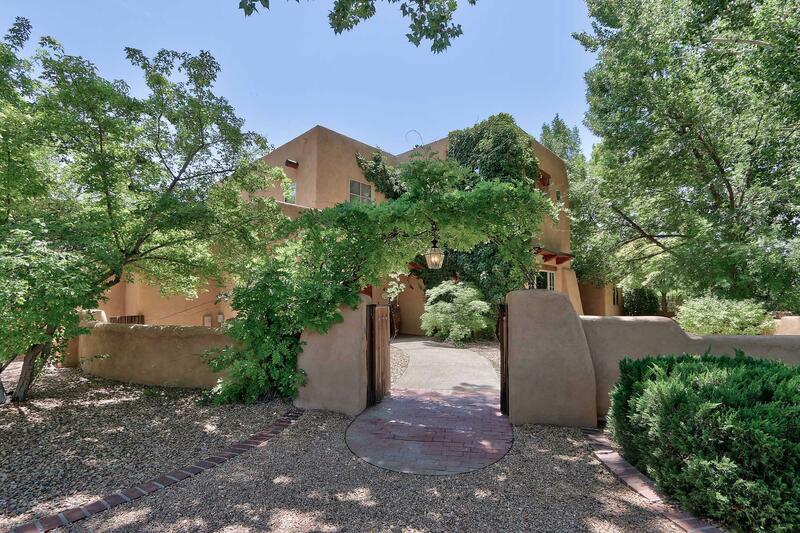 Property located in the north valley just west of the el pueblo rail runner with a combined 1. 17 acres featuring a home with 2,672sf, 3 bedrooms, 2 full bathrooms, 2 large living areas, a 14 x 18 workshop and a thriving boat and rv storage business! New roof and 2 new master cool systems! Su permit for su for boat, rv, auto & utility trailer storage, 54 storage spaces, electronic gated access and easy access from paseo del norte! 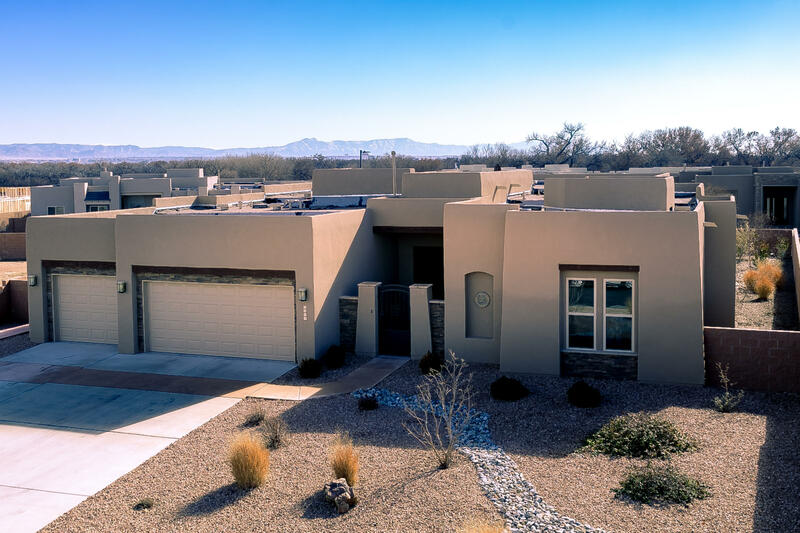 This beautiful, green-built (nm-bronze), scott patrick home is located in the gated community of el bosque at andalucia. Hiking trails thread thru the bosque to the san antonio oxbow overlook wildlife preserve. The open floor plan with raised ceilings is full of natural light from the many skylights & windows showcasing mountain & bosque views. The spacious kitchen with granite counters, island & breakfast bar, stainless steel appliances & large walk-in pantry opens to the great room for ease of entertaining. The split master features a large en-suite bath with soaking tub, separate shower, water closet & large closet opening to the laundry room for convenience. The guest wing features 2 bedrooms and 1. 5 baths. *some wheelchair accessibility; click the ''more'' link for additional info. 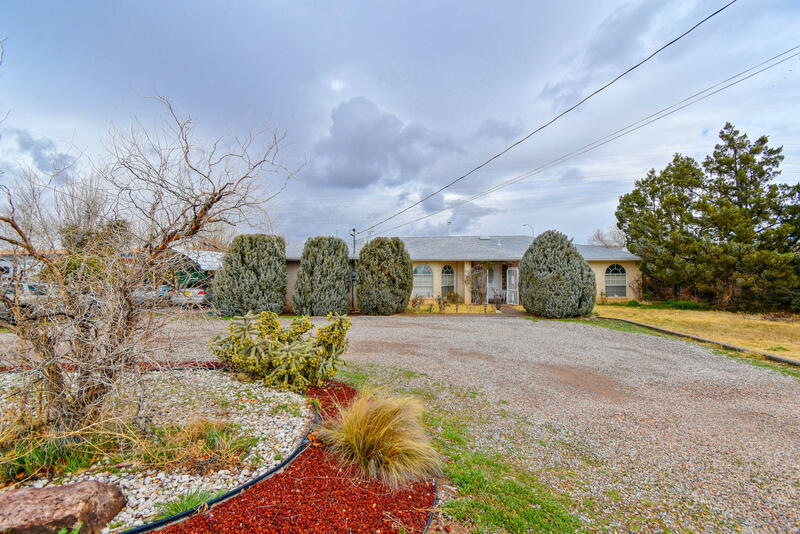 Amazing opportunity to own close to 2 acres backing up to the rio grande river in the middle of albuquerque! Listen to the sandhill cranes flying over as you pick apples, plums, cherries and more in your orchard. 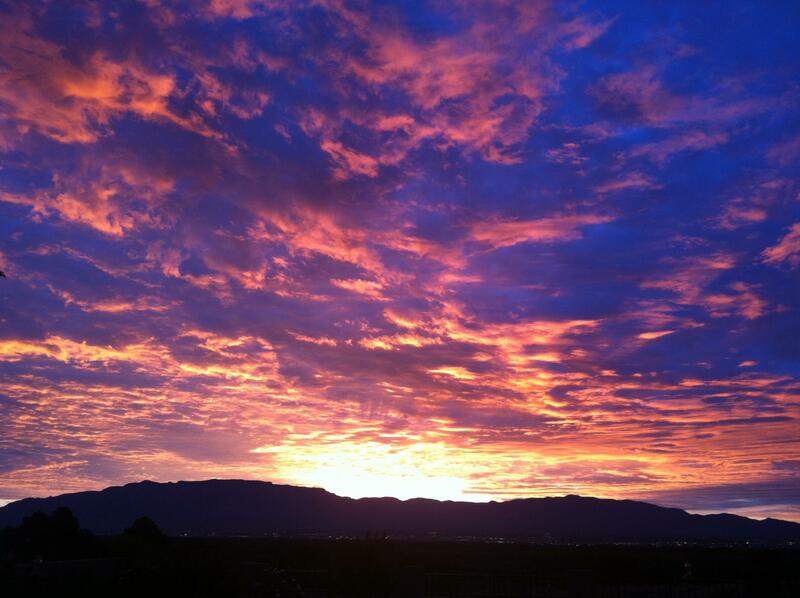 Watch the sunset pink up the sandias as you sip your favorite drink in solitude. 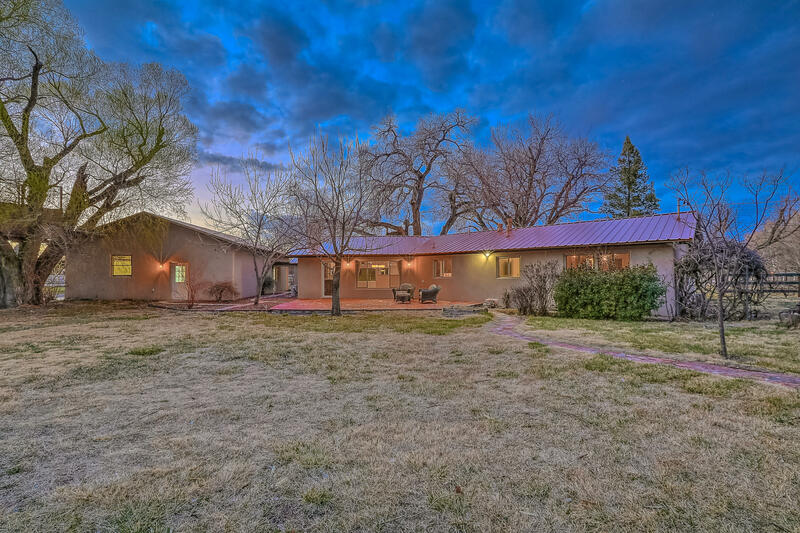 The home is a tastefully remodelled ranch with newer synthetic stucco, metal roof, and hvac system. The entire home has been redone with granite counters, new cabinetry, new wood-look tile floors, appliances, & hardware. Plus you get a large 4 car garage and a horse-ready barn with a tackroom. But the crowing jewel is the rare, private location on 2 acres, on a quiet street in the heart of the city. For the discerning buyer who understands it is all about location, location, location! 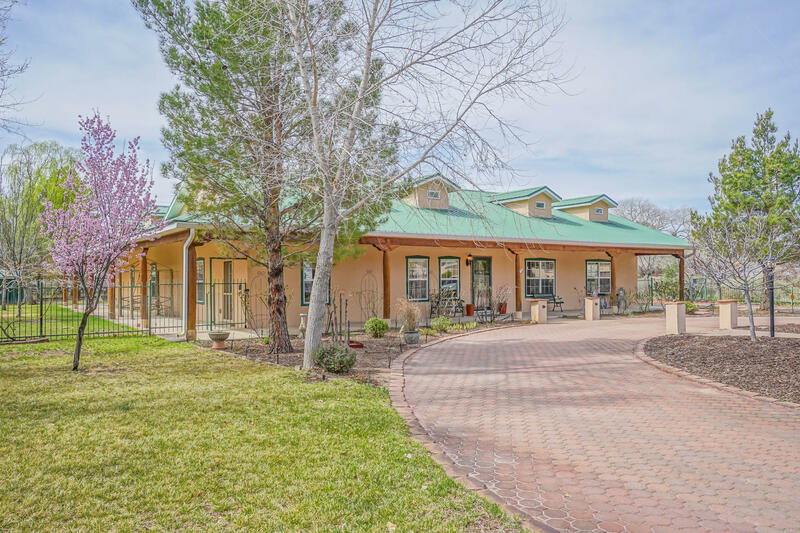 Savor this serene & private location yet only minutes from the bosque trails & conveniences such as shopping, entertainment, restaurants, & medical facilities. 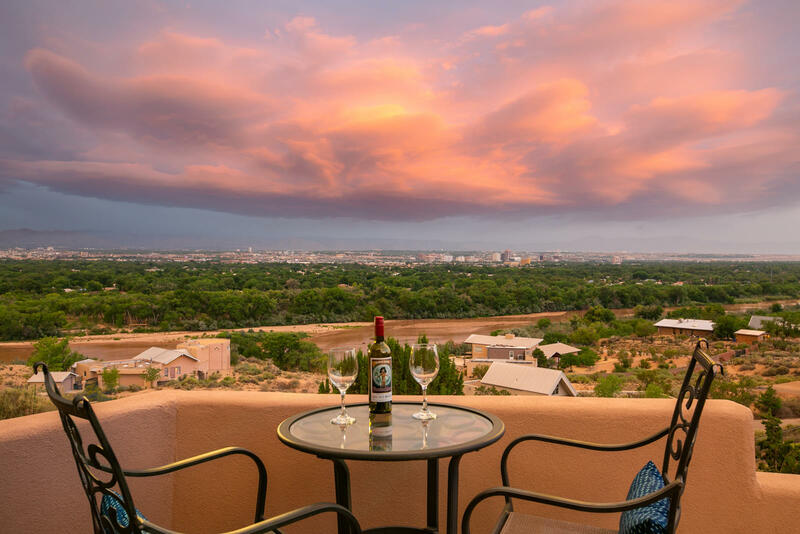 Rocking-chair-ready porches beckon you to this beautiful, single-level, northern new mexico hacienda that offers premium comfort with a dazzling array of amenities. High ceilings*3 fireplaces*2 living areas*formal dining plus a breakfast nook*all bedrooms have their own bathrooms*fabulous study with built-in bookcases & separate entrance*radiant heat*refrigerated air conditioning*a chef's delight kitchen. Stainless steel, granite, ample counter/prep space*oversized 3-car garage perfect for storage & hobbies*lush, green yards, shrubs, plantings & trees on 1/2 acre lot. Truly a refuge of joy & relaxation!